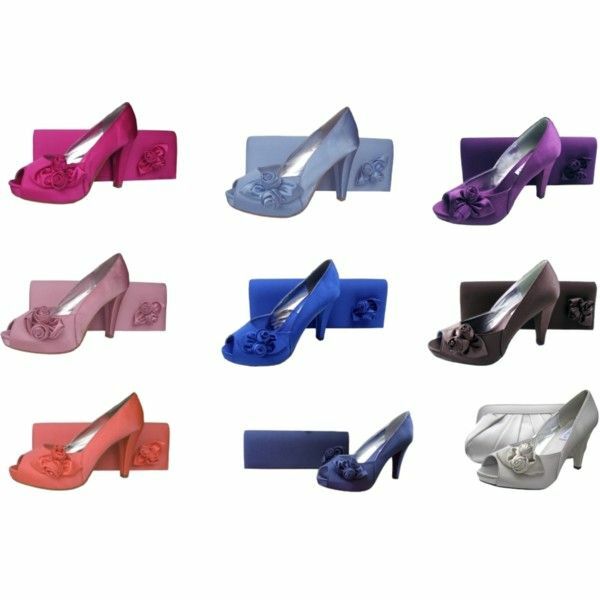 The Twee ladies evenings shoes by the designer Heavenly has proved so popular we have add more colours to the range. Yes, more colours!!! The current range included the vibrant lime green, express brown, navy blue, coral orange, and the pretty periwinkle blue. We have now added the pretty quartz pale pink, palomino pale silver, aubergine purple, hot fuchsia pink, bright sapphire royal blue and ivory. Now there should be a colour to match every outfit. Beautiful express brown satin sling back shoe by the designer Heavenly. An elegant closed toe shoe with a feature bow across the toes. Slingback ankle fastening for elongating your legs and a diamante encrusted buckle for that touch of sparkle. 6cm satin covered heel. A matching clutch bag is also available, style code TWE753. Stunning lime green satin sling back shoe. A matching clutch bag is also available, style code TWE153. The lime green satin ladies shoes will certainly add a zing to your outfit. Elegant navy blue satin sling back shoe. A matching clutch bag is also available, style code TWEZ53. This navy blue satin ladies shoe will certainly complete your outfit. So step on over to Sole Divas to view our extending range of ladies shoes and evening shoes.